A portable closet is a great addition to your home. It provides extra storage and keeps your things organized. Since it's designed to store many things, it is very important to get a sturdy one. It has to be strong enough to hold all your stuff. Otherwise, it would just fail to serve its purpose of giving you more space. I used to have a flimsy closet. It could actually fit in more things, but it would collapse every time I try to put in more clothes. Instead of maximizing my space, it took up the little space that I have and the closet was not even full! I had to put my clothes elsewhere. With all my clothes lying around, my home was a big mess. I learned my lesson and bought a sturdier garment rack. Quality should be your top priority! In this page, I will help you get the closet that suits your needs. Here are the things to consider when buying a portable closet. I like to rearrange my furnishings once in a while. Having a mobile closet makes things easier for me. Some closets have double rods. It doubles your hanging space and is certainly an excellent way to save space. Before you get this type of closet, make sure that you're not going to use this for dresses, trench coats, or any other long garments. Better yet, get a closet with a removable lower rod for more flexibility. This is ideal for storing tops and pants folded into half. If your closet has a covering, choose a color that will match your room. If matching colors is the least of your concern, you can opt for a darker shade. It will make dirt or stains less obvious. Needless to say, having a covered closet protects your things from dirt. Some designs have uncovered bottom to allow proper ventilation. Check the layout of the cover. Does it have a zipper? Is the opening in the middle or on one side? Remember that your things' accessibility will depend on the design of your cover. Some closet covers can be purchased separately. Read the customer reviews of the closet you want to buy. Reviewers usually mention this. As I've mentioned, make sure that it's made of good quality material. If the closet is made of metal, find out if it's stainless. Some people like to have their clothes and shoes in one place. You may consider buying a portable closet with a shoe rack underneath. You can put smaller items or delicate garments that you don't want to put in a hanger on the shelves. If you're going to put small items on the shelves, I suggest that you buy plastic shelf liners to keep the items from going through the holes. Most shelf liners can be cut according to the size you want. Storing your things in beautiful boxes will make your closet look nicer. However, if you're going to put bulky winter clothes into your closet, you can just buy the one without the shelves. This depends on your space and what you want to put in it. 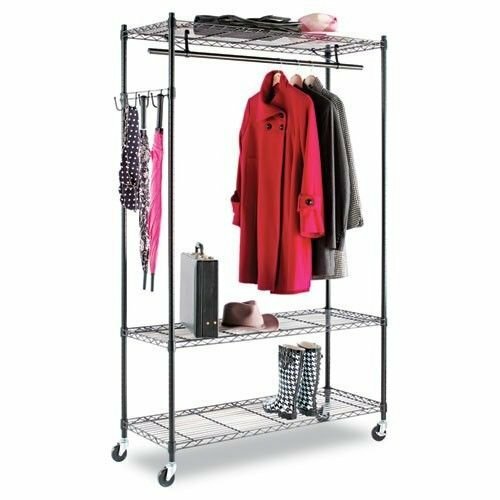 You can either buy one huge garment rack or two smaller ones. Some closets are also expandable!